With the coming of winter, many people look forward to skiing and other winter sports, but for those millions of people with chronic or acute sinus problems, winter can be a dreaded event. Sinus problems affect at least 30 million Americans, and are one of the most common complaints of patients seeking medical attention. Usually, sinus infections start with a cold due to factors such as weather changes; or an allergy episode that causes swelling of the mucous membranes and increased production of watery mucus. When the mucus changes from clear to a yellow or green color, it means a bacterial infection. The mucus builds up and the nasal passages become blocked because the sinus tissues are swollen. One consequence is the pressure and pain of sinus headaches. 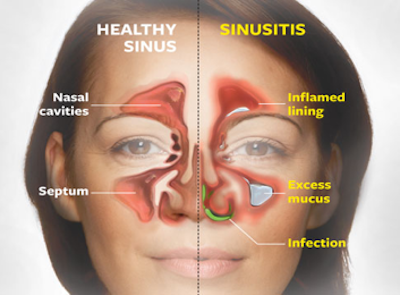 Other symptoms of sinusitis include: stuffy nose; sticky-yellow or purulent nasal discharge; nasal congestion; nosebleed; diminished sense of smell; headache; a feeling of heaviness in the head; fever; sore throat; and facial pressure around the cheeks, eyes, and forehead. In China, people use Chinese herbs and acupuncture for their chronic recurrent sinus infections. Many doctors offer herbs and acupuncture even for acute and severe cases. This use of acupuncture and herbs dramatically decreases the use of antibiotics, thus avoiding the abuse and side effects of antibiotics. It is very valuable for our society to have different options besides antibiotics, especially for the chronic and recurrent infections which conventional Western medicine has failed to cure. A fifty-one year old lady came to my clinic last November. Every year she suffered from repeated sinus infections, for which she used Bactrim and Amoxil, as well as some decongestants. Steam inhalation helped her a little bit. Her doctor tried his best to mask the signs and symptoms, but when November rolled around, she began her “miserable season” once again. It was a this point that she came to my clinic. Besides some of the typical signs and symptoms, her tongue showed a yellowish coating, and her pulse was rapid. In traditional Chinese medicine, this indicates a Wind-Heat type of sinusitis. Six acupuncture treatments, with a few more follow-ups and an herbal patent medicine, SinusEASE (Xin Yi Wan), helped her to have her best winter in six years. In addition to the Wind-Heat type of sinusitis, there are four other patterns of sinusitis in traditional Chinese medicine (see the box below for patterns of sinusitis). These five patterns have different causative factors, and treatment is based on the origin of the pattern. Wind-Heat of Lung: mainly caused by weather changes. Stagnated Heat of Gallbladder: mainly caused by emotions. Damp Heat of Spleen/Stomach: mainly caused by greasy and spicy foods. Deficiency Cold of Lung Qi: mainly caused by chronic illness. Deficiency of Spleen: mainly caused by improper diet, fatigue or over-thinking. Widely-used herbs for sinusitis include skullcap (huang qin), magnolia (xin yi hua), and cocklebur (cang er zi). huang qin, or baical skullcap root, is traditionally used for clearing Heat from the upper respiratory system, and Damp Heat from the gastrointestinal system. It has an inhibitory effect against bacteria such as staphylococcus aureus, pseudomonas aeruginosa, and streptococcus pneumoniae. Research also found that staphlococcus aureus which has become resistant to penicillin will remain sensitive to skullcap. Magnolia (xin yi hua), named “barbarian bud” in Chinese, is a lily-shaped flower with a hairy bud. In traditional Chinese medicine, it enters into the Lung and Stomach energy pathways (meridians), travels to the face, and winds up at the nose. This is why it is such an effective herb to open up nasal obstruction or congestion and to treat sinus problems. Clinical research shows that a decrease in mucus production is caused by applying xin yi hua to the nasal lining. Cang er zi, or cocklebur fruit, is used for any nasal or sinus problems characterized by a thick and viscous discharge. Pharmacological research found that cang er zi has inhibitory effects on bacteria such as staphylococcus aureus. Listed below are several effective Chinese herbal patent medicines for sinusitis which are widely used around the world. For sinus problems, the color of the nasal discharge and the color of the tongue are very important indications for making the correct diagnosis. One type of pattern with white, clear nasal discharge and a white tongue coating is totally different from another pattern with yellow nasal discharge and a yellow tongue coating. Different herbal medicines and acupuncture treatment strategies are used for the acute stage of sinus infection, for chronic sinus infections, and for the prevention of further infections. Incorrect diagnosis, incorrect acupuncture treatment, or incorrect herbal medicine might make things worse, even when using traditional Chinese medicine. Acupuncture is another important way to deal with sinus problems. Many people cannot breathe properly through their noses. After having needles inserted at certain points, they will open up and feel immediate relief. I have a male patient who came to the clinic one day for his chronic sinus problems. For twenty-five years, he could not smell or breathe through his nose. When he went home after the first treatment, his wife was cooking, and he told her it smelled good. Both of them were surprised that he could smell again, and also that he could breathe well through his nose. One acupuncture point which is highly effective and is used widely for nose congestion is Bitong point, meaning “opening up the nose.” I encourage people with sinus problems to massage this point regularly. Other points to combine with Bitong to achieve very satisfactory results are Yingxiang (LI-20), Hegu (LI-4), Quchi (LI-11), Juliao (ST-3), Yangbai (GB-15), and Fenglong (ST40). The last point, Fenglong, is used to eliminate mucus. Two very important points to enhance immunity and build up your own ability to fight off infections are Zusanli (ST-36) and Sanyinjiao (SP-6). To maintain the effect from your acupuncture treatment, or to head off recurring sinus problems, self-acupressure is very beneficial (see the box for self-acupressure points for sinusitis). Bitong (Extra Point): Located on each side of the nose, at the bottom edge of the nasal bones. The dietary approach is another way to deal with sinus problems. A Chinese medicine practitioner always considers the diet to be an important aspect of treatment. Many people have experienced an intensification of their sinus problems after eating certain foods such as cheese, which can have a congesting effect on the system. Generally, you should avoid foods which produce phlegm, such as cheese, ice cream, milk, butter, and fried foods (French fries, fried chicken, etc.). It is also a good idea to limit red meat consumption. Several of the patterns of sinusitis discussed in this article could be avoided through dietary modifications alone.